Biodiversity Hotspots are areas of rich and unique biological diversity under significant threat of transformation. There are 36 Biodiversity Hotspots globally, representing a mere 2.3% of the Earth’s surface area, but supporting more than half of the Planet’s endemic (restricted to a particular area) plant species and approximately 43% of endemic bird, mammal, reptile and amphibian species. 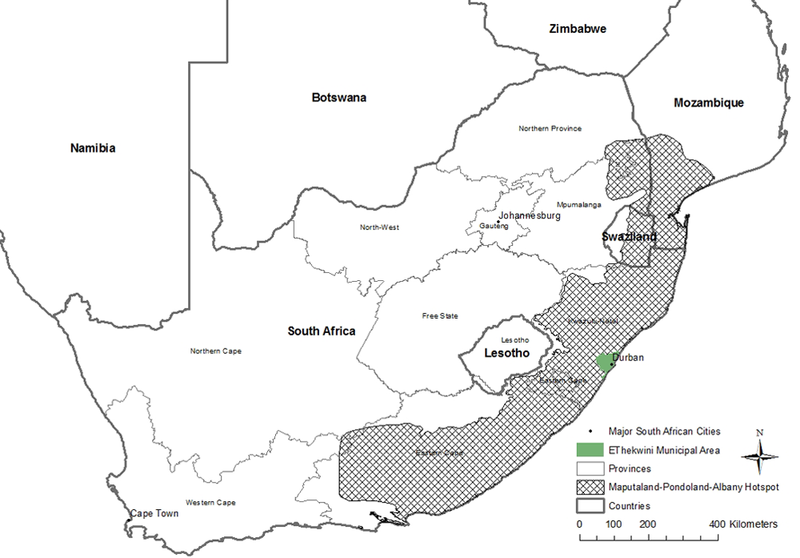 The eThekwini Municipal Area (EMA) is situated in the centre of the Maputaland-Pondoland-Albany (MPA) Hotspot. The region is home to more than 7 000 species of plants, 25% of which are endemic to the region, and a range of unique aquatic (wetlands, rivers and estuaries) and terrestrial (like forests and grasslands) ecosystems. The variety of landforms and climatic conditions in the EMA as well as its unique biogeographical position have resulted in a wide range of terrestrial and aquatic ecosystems that are home to a rich diversity of organisms. The EMA contains three of the country’s eight terrestrial biomes (large community of animals and plants that occupy a distinct region); namely savanna, forest and grassland. The aquatic biomes are represented by both freshwater and marine habitats and include 18 major river catchments, 16 estuaries and 97 km of coastline. In Durban alone, there are approximately 2267 plant species, 82 terrestrial mammal species and 526 species of birds. There are also 69 species of reptiles, 25 endemic invertebrates (e.g. butterflies, millipedes and snails) and 37 frog species. 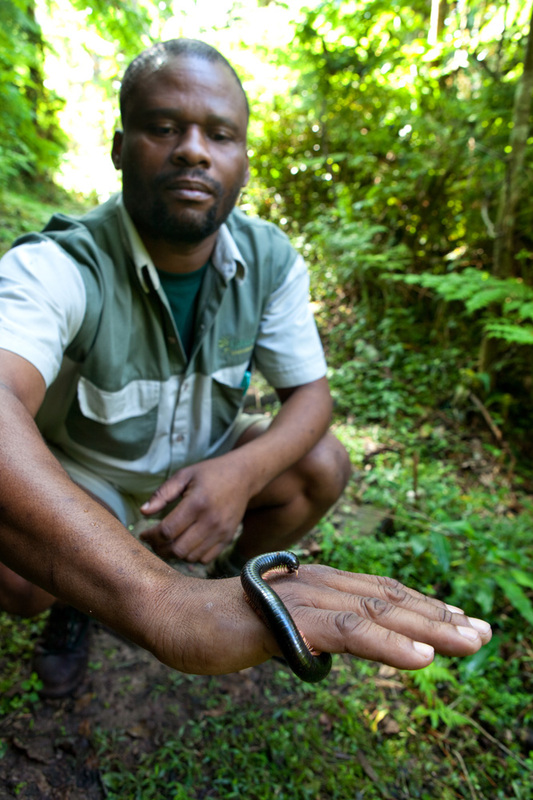 Thuthuka Majola, Conservation Manager for the Giba Gorge Environmental Precinct, with the only classified Endangered invertebrate species in the EMA – the Ruby-footed Black Millipede (Doratogonus rubipodus). This species is an EMA endemic and has only been recorded in the scarp forests of Krantzkloof Nature Reserve, Giba Gorge Environmental Precinct and surrounds (Photo: John Ivins). Ecosystem services have been defined as ‘the direct and indirect contributions of ecosystems to human well-being’. These contributions include provisioning services, such as supplying materials, food, and water; regulating services, such as streamflow regulation or maintenance of climatic conditions; supporting services, such as nutrient cycling that supports provisioning and regulating functions; and cultural services, such as spiritual or recreational benefits derived from ecosystems. Land cover change and management for agricultural, suburban, and urban use have resulted in the loss of ecosystem services globally, while population growth and development have simultaneously increased the demand for these services. Many urban areas are situated adjacent to Biodiversity Hotspots, due to the abundance of environmental services they provide. With the total global urban area expected to triple between 2000 and 2030, and an associated significant draw on the natural resource base, there will be additional pressure placed on these already highly threatened systems. Planetary boundaries is a concept that has gained popularity in recent years and describes a set of quantified thresholds for nine key earth systems. Crossing these planetary boundaries increases the probability of irreversible catastrophic environmental change. Of particular concern is that the biosphere integrity (or biodiversity loss) threshold has already been transgressed. Continual biodiversity loss will have major impacts on cities, as biodiversity is linked to human health and wellbeing of urban communities, and also provides a buffer against extreme events and slow onset disasters. This is particularly relevant to Africa, the most rapidly urbanising continent, where a large percentage of the population are poor and live in informal, often poorly-serviced settlements and are directly dependent on natural systems to meet their basic needs. Durban’s rich natural resource base has been negatively impacted over the past 150 years by the rapid rate of urbanisation, high levels of informality and pressures such as poverty and the need for basic services. As a result, development priorities have often superseded environmental and biodiversity concerns in decision making and all but the most inaccessible areas have been impacted by anthropogenic activity. In days gone by, the coastal dunes and parts of the Berea Ridge in the central part of the EMA were covered in extensive dune and lowland forests (the Stella Bush), low-lying areas formed large wetlands and the Bay was an impressive estuary with extensive inter-tidal mudflats and mangrove forests. Sadly, charismatic species like Hippopotamus and Elephant, which once roamed the EMA, as well as rare birds like Eastern Bronze-naped (Delegorgue’s) Pigeon and Southern Banded Snake Eagle, first described from specimens collected in Durban, are now locally extinct. Plants have fared no better and 6 of the 11 species considered to be extinct or extinct in the wild in KwaZulu-Natal were only ever known from collections made in the EMA. Historical aerial photography provides evidence that grassy environments, maintained by fire, dominated the landscape, with forest and savanna systems restricted to areas where fire was excluded. In addition to complete transformation, many remnant grassland patches have been degraded through altered fire and grazing regimes, plant harvesting for traditional and horticultural uses, and nutrient enrichment. There is also a general ongoing successional trend for grassland to be replaced by woody vegetation. Eastern Scarp Forest represents a notable outlier from the rest of the vegetation types in the EMA which have suffered area losses, in that the extent of this vegetation type has expanded relative to reference conditions. This expansion is attributed to the reduced influence of fire, habitat fragmentation, and increased atmospheric CO2, which favours woody plants with their C3 photosynthetic pathway. As an example, the Scarp Forest at Longshadows Gorge (part of the Krantzkloof Nature Reserve) on the Molweni River between Bridle Road and Ashley Drive has, between 1937 and 2013, increased from 49 to 108 ha at the expense of the now Critically Endangered KwaZulu-Natal Sourveld (KZNSS) Grassland. The Krantzkloof Nature Reserve and surrounds in 2013 and 1937. Notice the general increase in woody vegetation cover at the expense of grassland systems. Working in the context of a highly pressurised natural environment it is becoming increasingly evident that more information is needed to: firstly, motivate for the protection of certain conservation worthy areas against alternative, competing land-uses; and secondly, to identify priority areas for conservation action so that a representative Conservation Area network can be secured before these areas are either completely transformed or degraded. This requires an in-depth knowledge of the biodiversity features (conservation worthy species and habitats) and ecological processes in EMA as well as the pressures (e.g threat of conflicting land-use plans) and opportunities challenging the continued persistence of Durban’s biodiversity assets. In order to achieve this the eThekwini Municipality’s Environmental Planning and Climate Protection Department undertook a Systematic Conservation Assessment (definition below) for the EMA. Ideally one would need to have a complete knowledge of all the species in a given area, their distributions, population dynamics, life history requirements, and associations with other species. In reality, however, one can only rely on a small fraction of a given system’s information to base decisions on, especially complex ecological systems such as those that occur within the EMA. 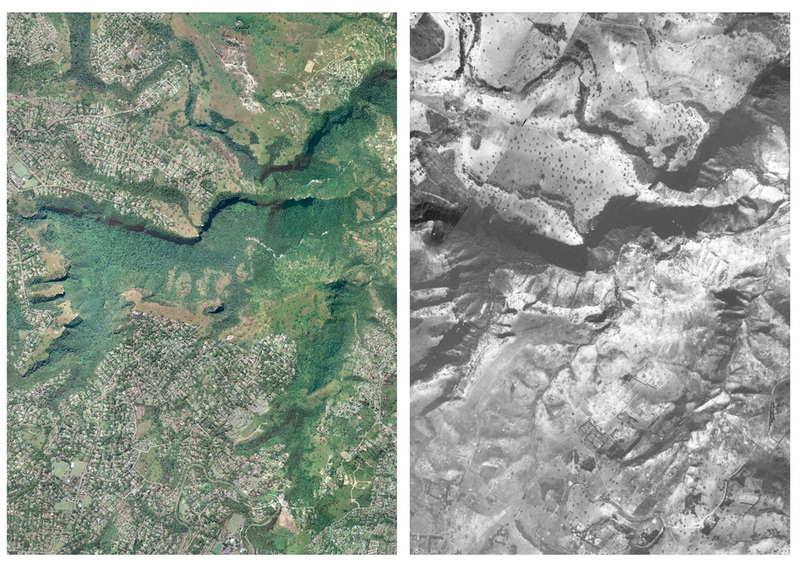 In instances like these one has to rely on the use of biodiversity surrogates (biodiversity features or processes that reflect the greater biodiversity complexities of an area), and in the case of eThekwini this relates to the use of a fine-scale habitat map. A visual comparison between the historical and current vegetation distributions highlights the level of transformation and fragmentation that these systems have been subjected to. Across all the vegetation types a mere 29% of the original distributions remain relatively intact. Furthermore, at least 6 (predominantly grassland and coastal forest systems) of the 14 vegetation types within the EMA have been transformed to a point that it is no longer possible to meet the required target (area required to reduce the risk of the extinction of species). This highlights the challenge and low-choice planning environment facing the City. The situation from a conservation perspective is undoubtedly bleak, but there have been a number of notable successes. 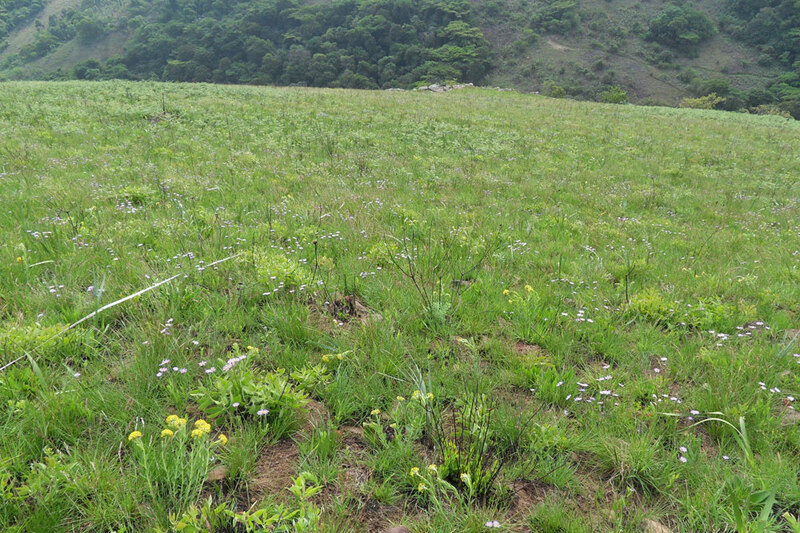 The Durban Metropolitan Open Space System, which is the spatial representation of the City’s important biodiversity and ecosystem service areas, has increased by more than 4000 hectares in 2016 (totalling over 78 000 hectares) and provides a level of protection to a number of critical ecosystems. 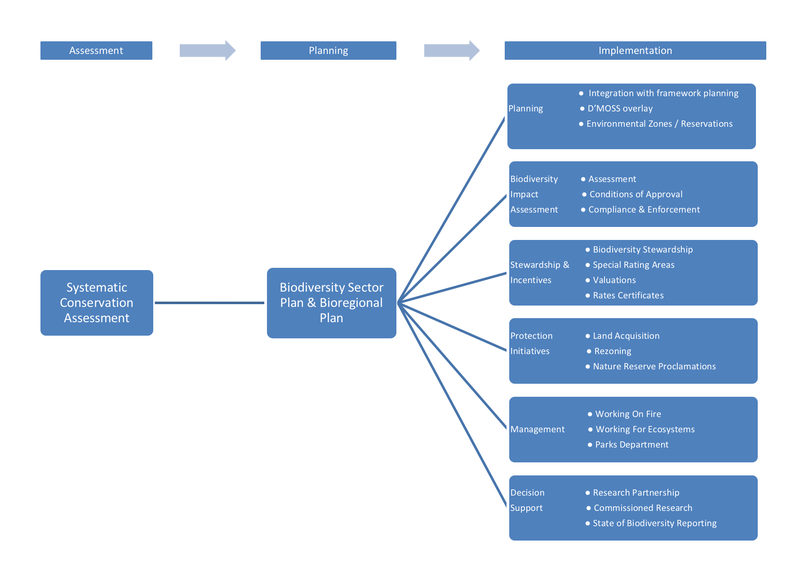 More importantly, however, the values of systematic conservation planning have directly informed conservation interventions (both proactive and reactive) within the EMA. There have been a number of positive biodiversity outcomes from the various implementation tools, but the purchasing of land for conservation has been a particularly successful one. In just over a decade, with a relatively small annual budget, approximately 619 hectares (an area about the size of Krantzkloof Nature Reserve) of priority biodiversity areas have been acquired. More specifically, of the total area of land acquired for conservation since 2002, 263 hectares includes the Critically Endangered KZNSS. This is significant in that more KZNSS is now conserved by local government than any other sphere of government directly mandated to protect biodiversity. Habitat transformation is the single greatest threat to biodiversity and the delivery of ecosystem services. The pursuit of personal development objectives should therefore be framed within an environmentally responsible context (the “duty of care” principle). The reality is that only a small fraction of D’MOSS is formally protected and managed for conservation. Citizens, in line with the “duty of care’ principle, are encouraged to embrace the presence of D’MOSS and contribute towards maintaining the ecological integrity of these natural assets. The Systematic Conservation Assessment is only as good as the data informing it – there are a number of citizen science platforms (e.g. iSpot) to record localities of important species. 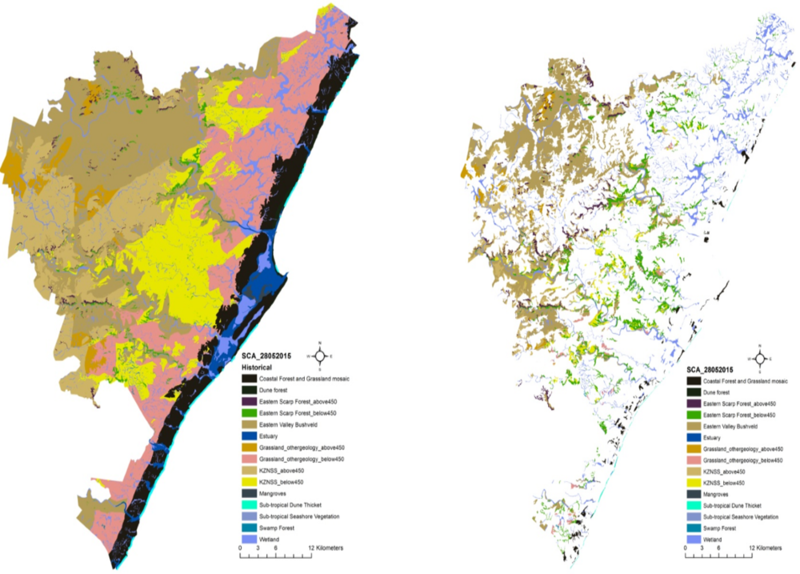 These data are vital in guiding the selection of Durban’s critical biodiversity areas. It really is a case of “all hands on deck” so joining a local conservancy and working jointly with the City on priority areas will definitely move us in the right direction. 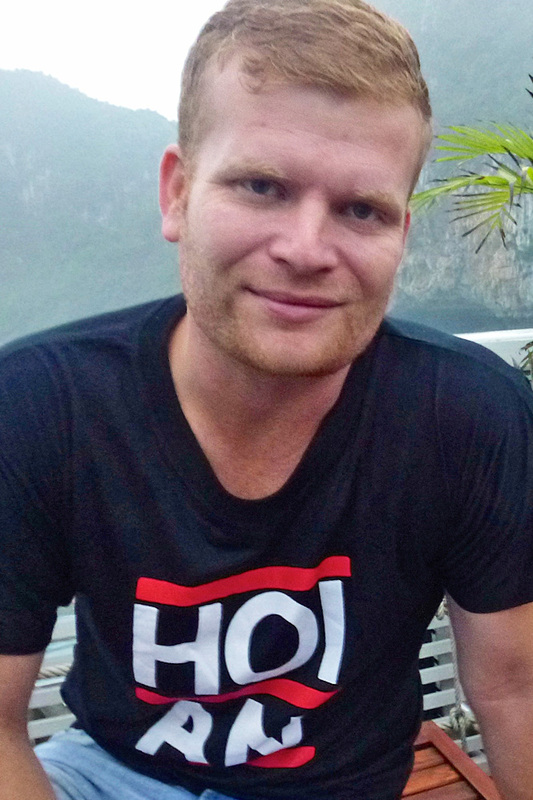 Cameron McLean is a Senior Ecologist in the eThekwini Municipality’s Environmental Planning and Climate Protection Department. His current position is primarily focused on systematic conservation planning but he has extensive experience in estuarine ecology, having completed a MSc on the estuaries of Durban. Cameron has led the Department in the development of Durban’s Systematic Conservation Assessment, which was used to inform the latest iteration of the Durban Metropolitan Open Space System.